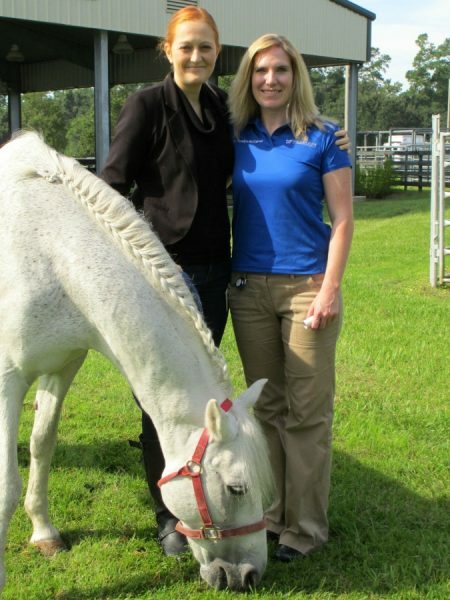 Dr. Anje Bauck (left) and Dr. Taralyn McCarrel (right) pose for a picture with Bandit prior to discharge. On the evening of February 10, 2015, Bandit, a 12-year-old Paso Fino gelding, was found in his pasture non-weight bearing on his right hind leg inflicted by a suspected horse kick. Bandit’s veterinarian, Julia Dietz, DVM, was called to the scene to perform an evaluation and to take radiographs out in the field. Unfortunately, the radiographs indicated a fracture of the right third metatarsus, also called the hind cannon bone. Bandit was immediately referred to the UF Large Animal Hospital for further evaluation. Dietz stabilized the limb with a splint prior to transport which was a critical step in the success of this case. The importance of proper stabilization to prevent fractures from becoming open cannot be overemphasized. Bandit underwent CT imaging and surgery the following day. McCarrel placed a plate to span the fracture and a transfixation pin cast (TPC). The goal of the TPC is for the weight to travel down the leg and then the weight is redistributed through the pins and down into the cast minimizing the load experienced by the fractured portion of the bone. This is done to buy time for the fracture to heal and gain stability as well as to keep the horse comfortable. McCarrel said, “I was now faced with several surgical challenges which included a fracture that extended into the joint with likely joint surface injury, a small distal fragment, and two butterfly fragments disrupting the column of bone.” Damage to the joint meant that Bandit would be predisposed to arthritis. “I would typically use at least three to four screws in the plate on either side of the fracture, but this was not possible since the fracture was close to the end of the bone within the fetlock joint,” explained McCarrel. As for the distal fragment, the size was too small for a dynamic condylar screw which is a special plate to add strength to fixation of fractures in close proximity to a joint. Another potential option was two long plates placed on the front and one side of the bone. McCarrel shared that “more metal is not ideal for traumatized skin which could also increase the risk of infection.” McCarrel also did not want to risk breaking more of the butterfly fragments. A shorter incision was made where the skin was in good condition and a plate was placed with four screws. Two of the screws went through the plate and fracture line to help compress the fracture and improve stability. The other two screws were placed on each side of the fracture through the plate. Lastly, three large pins were placed through the middle of the bone and incorporated into a cast, hence the name transfixation pin cast. Happy to be home in St. Augustine. The surgery took about 3 hours to complete. “Bandit recovered perfectly from general anesthesia, however, there are risks with TPCs including pin breakage and the bone can break through the holes created for the pins. The pins also eventually loosen and cause pain,” said McCarrel. Bauck also explained that “the recovery from anesthesia is a critical step in the success of a fracture repair. Unlike some species, horses have to be able to fully bear weight within an hour or so after surgery.” The first cast was placed to the level of the tarsal bones to help protect against cannon bone fracture related to the pins. After less than 6 weeks, the pins are expected to become loose, at which time they will need to be removed. Bandit did develop a cast sore at the top of the cast due in part to the proximity of the cast to the hock. The cast sore did cause some pain but was managed by gradually reducing the height of the cast to adjust the site of pressure. Overall, given the amount of time Bandit spent in a cast his skin remained in very good condition, in part because he was kept indoors in an air conditioned stall which was also conveniently located directly across from surgery. The heat and humidity in Florida adds to the challenges of cast management because the skin sweats inside the cast and is more susceptible to developing sores. McCarrel prefers to manage horses with casts in the hospital so that problematic situations, such as cast sores, can be addressed more quickly and because the horse can be kept in a climate controlled environment. Bandit’s left foot was placed in a small foot cast with a custom support pad to offer additional cushioning and to keep the casted fractured limb and the opposite limb the same length. 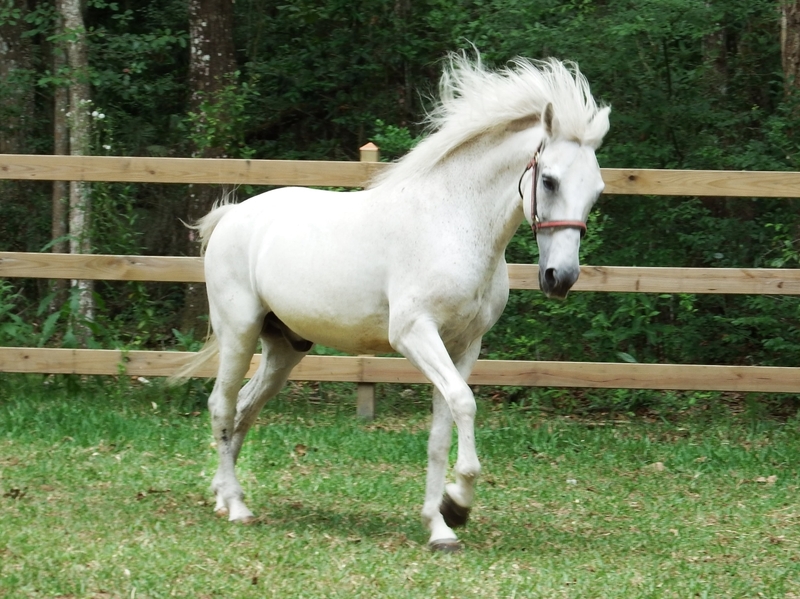 “It is just as important to manage the opposite foot which is at risk of contralateral limb laminitis,” said McCarrel. Bandit remained in the hospital until he was off all medications and no longer needed any bandaging. In addition, a new barn was being constructed for Bandit at home. Once the new barn was completed Bandit was given the green light for discharge on September 3, 2015. The last radiographic evaluation of the right hind limb indicated healing of the fracture with progressive bone formation associated with the butterfly fragments. 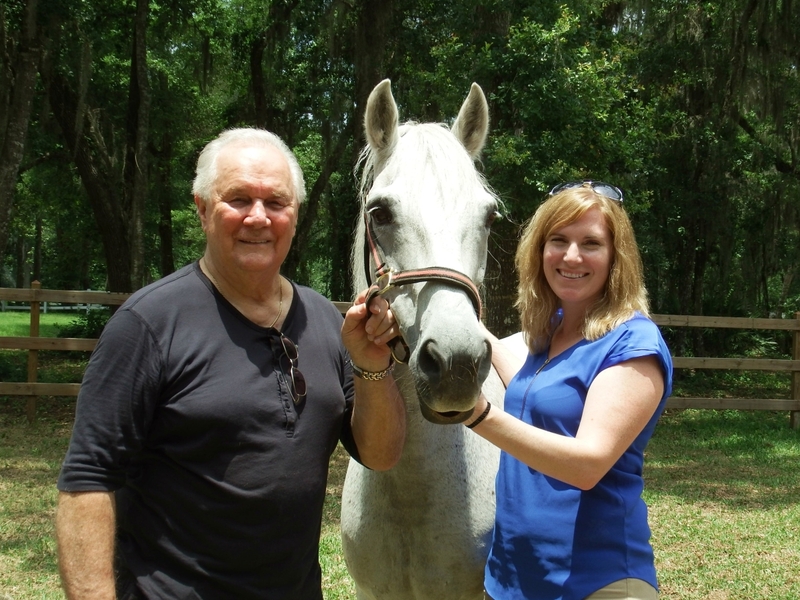 Bandit developed fetlock arthritis as expected and will always have a reduced range of motion, but it does not interfere with his day-to-day life. Bandit was readmitted to the UF Large Animal Hospital a year after the accident for recheck radiographs and implant removal. He immediately settled back into his previous hospital stall and was right back into his old routine, prompting the hospital technicians when it was time to be fed. On June 6, 2016 McCarrel made a special trip to see Bandit back at home in St. Augustine. It was a happy reunion and both McCarrel and Pollack could not be more delighted about how well he is doing. “He’s a pretty smart horse who takes care of himself,” remarked Pollack.